I went up to my Baba’s house this past weekend – Baba is Hungarian for grandmother – and taught me how to make a cookie that is part of our family tradition. Kifli (pronounced Kee-Flee) are little pastry cookies filled with either walnuts and condensed milk – yum! 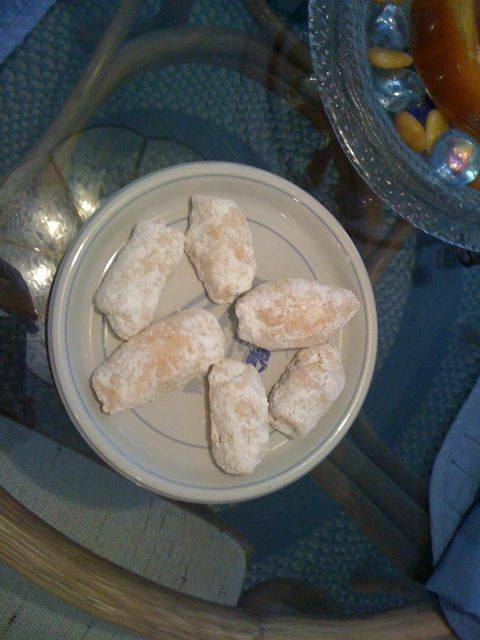 – or a fruit preserve and then dunked in powdered sugar while they’re still hot. The walnut version is far superior, in most of my family’s eyes, so we made a batch for the coming Thanksgiving holiday. A batch is roughly 9 dozen, so it takes a while to make. My Baba pulls out the two cookies sheets we’ll be using and grabs parchment paper for the one and butter to grease the second. She tells me that, if I don’t want the added expense of parchment paper, I can make them just as well on a greased cookie sheet. Then she mentions that Kifli baked on parchment comes out better. To which I wondered, if she has already tested this and knows which is better, why are we making a batch not on parchment paper? As you can guess, the parchment Kifli turned out beautifully. Those on the greased cookie sheet are a little more “done” on the bottom than I would prefer. But I guess Baba made her point. The Kifli in the photo are from the parchment paper. FYI for all you Moms and Moms-to-be: Dozen Cupcakes is giving away free cupcakes while they’re open from 9 am to 3 pm today – Mothers Day. First come, first served. I believe it’s only the Lawrenceville location (links to a map of their store) as they’re the only store with listed Sunday hours, but I could be wrong. Though … who wouldn’t drive to their different locations when in need of a perfect cupcake? Did you remember the time change? It was so very difficult to wake up this morning and know that the clock staring back at me was telling me where I’d been, but not in a Delorean kind of way. I felt so out of sorts for the better half of the day that I was publicly grumpy at mass with my Mom – not good – and almost cried when I got home and found out Dunkin’ Donuts had put the wrong “vanilla” donuts into my bag. I’m sorry if I’m a donut snob, but when I ask for a chocolate iced, vanilla cream filled I most certainly do not want a powder sugar donut. Nor can a vanilla iced cake donut be substituted for a chocolate iced chocolate cake donut. They got my coffee right but that’s like saying you remembered the time change. You still lost an hour. Ash Wednesday. First day of Lent. First day for giving things up. Useful things. Needless things. 40 days of going the distance. Can you do it? Can you give something meaningful up and regardless of missing it, wanting it, needing it make it to Easter Sunday without indulging. When I was kid there was always the “Give up TV” rule instituted by the dictatorship. I think that would last about a week before the TV started to stay on slightly past the 6:00 news and slide down the slippery slope towards prime time. When that didn’t work, things “given up” became more service minded – Mom asking for 40 days of peace in the house – minimal petty arguing among those in the peanut gallery. Riiiight. Then, as you got older, you started to use Lent to redeem your New Years Resolution. “Well, I was going to start eating better and working out – I know! I’ll give up sweets!” So you stop swinging by the office candy desk – we’ve all got one – and try and make an extra trip or two to the gym in the course of the week and, by the home stretch, well you’re not exactly eating the forbidden Girl Scout Samoa ice cream, but a hershey kiss won’t hurt anyone. Except I don’t hanker after sweets. Well, ok, maybe once in a while I get into that mode where if I don’t have chocolate now, heads will roll, but that’s very rare. So giving up sweets really isn’t the way to go. And I could say instead of giving something up, I’ll just make a concerted effort to do something better – generosity, forgiveness, etc. But it’s not enough. I mean it is. But it isn’t. So this is how I stuck my foot in my mouth – Or took my hand out of my wallet as it were. Lunch Buddy: Eh. It’s ok. I think it’s from yesterday. Me: Bummer. I could use something sweet. Gave it up for Lent though. LB: Really? You don’t have much of a sweet tooth. You should give up something else. LB: Yea. Something big. Sweets are small. Me: Something big? What? Like, shopping? LB: (Huge Eyes accompanied by a shriek.) YEAH!!!!!! Everyone knows the economy isn’t doing well, poor kid, but that really isn’t the reason I’m doing this. And getting further out of debt is just a side bar – my original New Years resolution (btw) that I have kept up with – this truly will be a test. I’m not a credit card wielding, couture buying, sample sale fighting diva. I’m a bargain hunting, sale watching, price adjusting shopper. But either way you can get yourself into trouble if you’re doing the a fore mentioned methods of procurement. I’m not in serious trouble, but I have had to push off a few major purchases because of a killer pair of boots I’ve just picked up or a skirt that was so dirt cheap on sale you can’t make it yourself for that price. My point is that shopping is a big part of my life. I use it for stress and celebration alike, shopping for myself or for others, so giving this up for 40 days is going to be difficult. Extremely difficult. And I know this. There will be no new shoes. There will be no sale rack hand bags or jewelry bin deals. There will be no shopping. For 40 days. There are ground rules. I am allowed to pay off debt with money usually diverted to shopping, as well as maintain my normal monthly bills. I am not allowed to hand over my credit or debit card for anything which has a price tag on it that needs to be removed. No new houseware items. No new clothing. No new shoes – that one hurts so much I’ve said it twice. Nothing second hand either. No loop holes! 39 and counting… Here we go.